Traveling Tips: What's in my Travel Tote? What's in your Travel Tote? 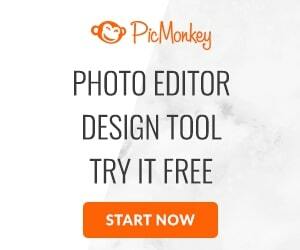 This post: What’s in my travel tote? was sponsored by Dramamine® as part of an Influencer Activation for Influence Central. Yuck! Motion sickness. It can happen anywhere, boats, car’s, airplanes. There’s nothing worse than the onset of a tummy cramp or a wave of nausea and you know it’s only moments away. It can happen at any time, and it can happen when you’ve never had it before. In my house, there are several of us that suffer from motion sickness. Doug is actually the worst of all of us affected. He can’t ride in the back seat of a car, he can’t do water activities, we’d love to take a cruise, but this is not in the cards. Long drives can be rough on him and he makes a lousy passenger because then it’s worse. Airplanes aren’t AS bad, but still wreak havoc. He uses Dramamine when he knows he is going to be doing something that may cause nausea, which helps greatly. One of the things he often has occur is that he gets sleepy after taking it, which can be a problem when you arrive at your destination and you’re supposed to be on your A game. So we disovered Dramamine Non-Drowsy Naturals. Dramamine is the leader in motion sickness relief. Dramamine Non-Drowsy Naturals is the first non-drowsy natural solution for motion sickness. 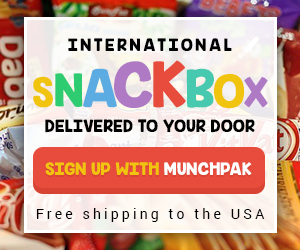 It contains a clinically tested ginger dosage that’s required for preventing and treating motion sickness, which has better results than typical remedies like ginger ale, tea, candies and gum. It helps prevent motion sickness symptoms like nausea and vomiting, which other products like antacids and upset stomach relievers cannot do. Plus, it’s made from natural ginger, which makes it safe to use every time you travel! In my opinion, that’s a win-win for Doug, and the rest of the gang who need it. I cannot actually tell you how many times I’ve had to drag a drowsy group of people down an airport corridor to go wait for luggage and then watched them groggily juggle their luggage all the way to the rental car or even to our car to head home. Not fun! What’s in my travel tote? I always switch out my purse on travel day, and pack that in my actual suitcase empty. I pack a separate travel tote, that I can keep with me at all times. I keep all the things I could need at a moments notice with me, especially for longer trips. 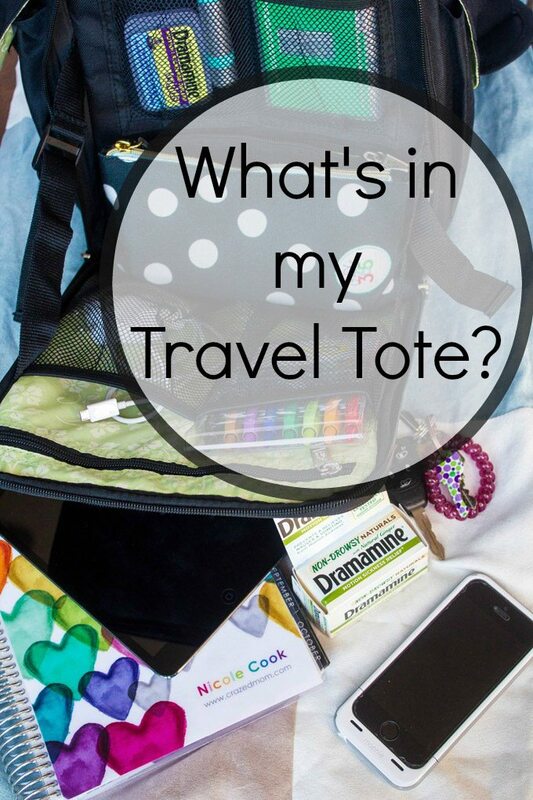 So what’s in my travel tote? Notebook, because I always have to have paper with me. Plus several pens for writing. My Planner, it goes everywhere with me. My Keys plus I often pack a back up set in my suitcase just in case. My Cellphone, which I typically tuck in an outer pocket so I can reach it quickly. My Wallet, with a small amount of cash inside. I keep my credit cards and ID separately in a smaller wallet I usually tuck in an inside zipper pocket. I also often tuck larger bills throughout the bag in different places, plus I always carry a small amount in my pocket, as well as sometimes tucking some into my shoe. 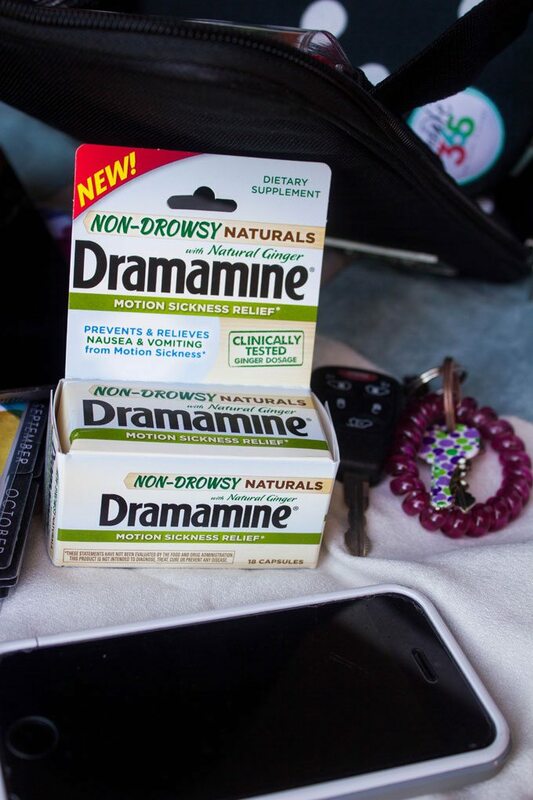 Dramamine® Non-Drowsy Naturals, because we’ve needed it plenty. Dramamine® for Kids because my kids suffer too. Lotion, I have extremely dry skin so I always have some with me, I can refresh my face, moisturize my hands, etc. Travel Toothbrush and Toothpaste, because on a long travel day, this can honestly make me feel SO much better. Headache medicine, because I inevitably get a headache from stress and noise while traveling. Charger cords for both the phone, the Mophie and the iPad Mini. Headphones because I need to block out the sound occasionally, plus music calms me so I will pop some on to just relax and get lost for awhile. So I showed you What’s in my Travel Tote – what’s in your travel tote? 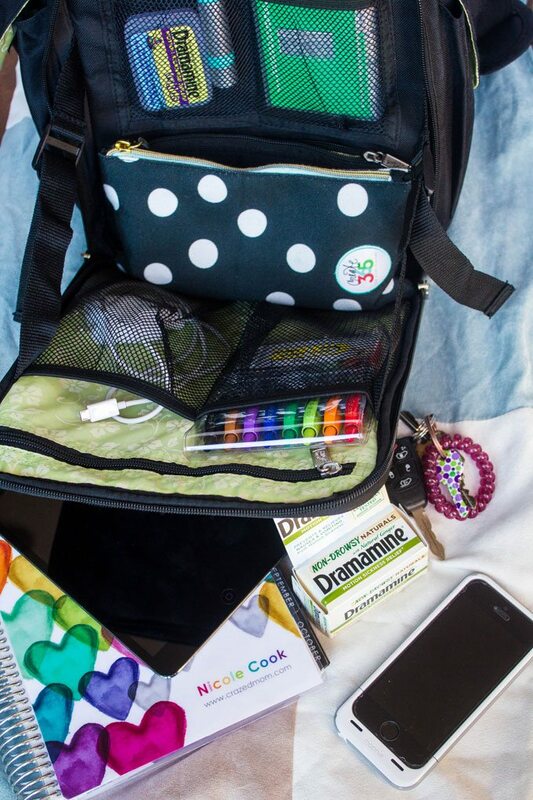 You can get a $1.00 coupon to save on your own Dramamine Non-Drowsy Naturals, to make what’s in your travel tote make life a little easier.